Stud Sensor HD55 deep-scanning stud finder boasts more design innovations by Zircon. Featuring an enhanced LCD display, it debuts a new Target Spotlight that illuminates on-screen when you've found the edge of a stud. Select from two stud scan modes to find the edges of wood and metal studs and use the BONUS level to assist with hanging mirrors, shelves, and cabinets to the wall while also avoiding live AC electrical wiring. Zircon Corporation, ("Zircon") warrants this product to be free from defects in materials and workmanship for one year from the date of purchase. For more information, please call 1-800-245-9265 or email info@zircon.com. Milwaukee<sup></sup> 10IN1 Ratcheting Multi-Bit Drivers feature 3-1/2" power groove bits for power tool compatibility and maximum jobsite versatility. The chrome plated bits provide Marine-Grade rust protection and reduce wear from the elements on the job. The all metal high torque ratchet allows for 2X faster driving without sacrificing control. Milwaukee 10IN1 Multi-Bit Drivers are designed for the jobsite and include Milwaukee's Limited Lifetime Warranty. Stud Sensor HD55 Stud Finder with Bonus Level Stud Sensor HD55 deep-scanning stud finder boasts more design innovations by Zircon. Featuring an enhanced LCD display, it debuts a new Target Spotlight that illuminates on-screen when you've found the edge of a stud. Select from two stud scan modes to find the edges of wood and metal studs and use the BONUS level to assist with hanging mirrors, shelves, and cabinets to the wall while also avoiding live AC electrical wiring. Stud Sensor HD55 Stud Finder with Bonus Level is rated 4.4 out of 5 by 5. 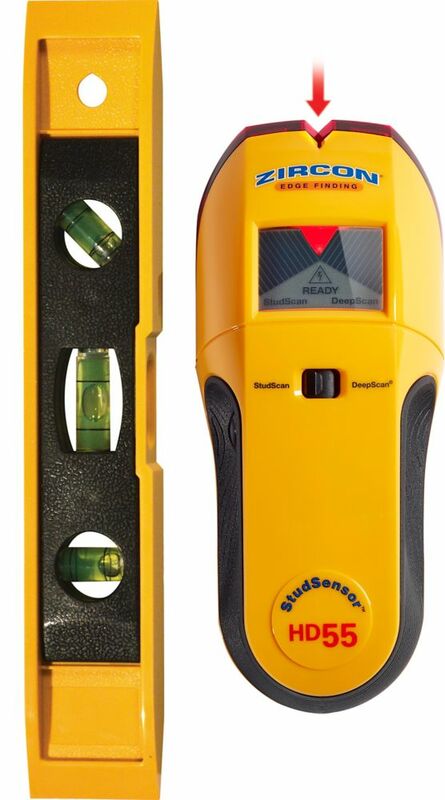 Rated 5 out of 5 by Baba from HD55 STUD FINDER WITH BONUS LEVEL This is an excellent tool. Find deeper studs as well. It is very handy due to its compact size yet performance wise, it supersedes many top of the line products. I am very happy that I choose this product. A mini level was a bonus gift which I am also using frequently for picture frames levelling. Rated 5 out of 5 by HELEANA from Great product I got a great price for this product... did the job well! Great buy! Rated 3 out of 5 by JaniceL from 55% v/s 45% It found a stud with 55% success. Remain 45% was a complete chaos. Rated 5 out of 5 by Razcal from A Great Buy! Great product! Performed well and met all my expectations in scanning for studs on different surfaces. I like how it comes with a mode selector for deeper scan up to 1.5 inch, wire warning indicator display and a spot light arrow that points where the edge of the stud is on the wall. Plus a torpedo level as an added bonus and it's almost $4 to $5 cheaper than buying the individual. Rated 4 out of 5 by Steven from It works I used this to find joists through a popcorn ceiling where knocking, magnets, and my ancient stud finder had no luck. When working on a popcorn ceiling, my recommendation is to put a piece of cardboard between the sensor and the ceiling and set it to deep scan mode. It wasn't perfect, but in combination with a measuring tape, I was able to find what I needed. I'm not sure why the package with the level is cheaper than the HD55 on its own, but if you can't find this one on the shelf, just pay a few bucks more for the HD55. Worth it.